It may sound like a cliché, but nothing is truer for business owners: You’re only as good as your employees. And because nothing’s ever easy, few challenges are more delicate than keeping valuable employees happy and motivated. Do it wrong and you’ll face the dreaded revolving door. Do it right and you keep strong contributors from leaving, retain institutional knowledge and customer relationships, and enjoy lower recruiting and training costs. In the press of daily business, it’s easy to lose sight that situations change and that people evolve. I like to do an exercise with new employees where I look at their motivators and ways I can help align their job experiences with those motivators. Getting married, having children, a death in the family, or other life changes are stressful. Many make proactive changes when family situations arise. Employers need to be supportive, even if that means letting an employee find a new position. Family situations also make us rethink our lives and purpose, so be mindful of working with staff to understand the impact of such introspection. Be careful not to manipulate a situation. Do what’s right for the employee. Moving to a new location can be nerve-racking. Employees might not like the new locale. They might have doubts about being successful in a new region. Conversely, they might want to make what would otherwise have been a temporary move permanent. Make sure to touch base more often and be empathetic about the stress that moves can cause. This also goes for people that remain in your city but moved, and now have a longer commute! A new degree often can spark desires for a professional change. Get in front of things and determine with the employee how the organization might best be able to leverage his or her newfound skills or accreditation. Projects get completed, promotions happen, or people just start realizing that they’ve reached that next level. Keep in mind that one of the top motivators for many employees is to have interesting work. This means that when each challenge is complete, or skill mastered, you need to look out for what will be next for members of your staff. For many, keep them engaged and they’ll stay happy. This is usually a wake-up call for employees. They might see a ceiling they can’t break through… and there’s a chance the ceiling is real. Be real with staff about what they can do to better prepare next time and offer them alternatives -even if those conversations are difficult. If you aren’t completely honest, you are doing the employee a disservice. Many of us want to work with the latest and greatest technologies in our industries. If your technology is getting stale, there many reasons to update it. Not only does it make you more productive, but staying current also keeps your employees happy and engaged. When a popular manager leaves an organization, moves up or shifts to a new team, businesses need to recognize that this can be a stress for staff and handle the transition with care. 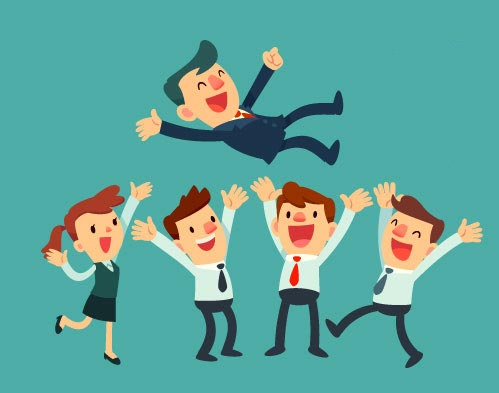 Companies that are doing really well financially often have happy employees. Everyone likes being on a winning team. If sales dip, there are less resources for pay increases, bonuses and perks. When profits are down, it’s critical to show staff what the plan is to turn things around and equally as important, how each team’s contribution impacts the overall performance. That’s a good idea even when companies are doing well! We all form friendships in the office. When someone leaves, there are a few things to keep in mind. Your staff formed a bond with this person and morale could now take a hit. The outgoing employee may recruit people to his or her new organization. And there may be duties that, even for just a short time, roll onto those remaining. Again, the key is empathy and communication. Don’t ignore the 800-pound gorilla that a well-liked colleague has left. Talk about it openly with employees. It seems obvious, but any time there are changes in pay, benefits, or workplace policies, make sure to over communicate details about the changes and listen and respond to the needs of staff. Go above and beyond. Taking care of employees should considered your top priority when you’re running a business, along with serving customers well. Keeping your fingers on the pulse of the myriad changes that can affect employee mood is crucial. You can contact us to talk about your employment needs, and how we can best serve you. Loughlin Personnel respects the privacy of our clients, applicants, employees and workforce suppliers very important and we acknowledge that you have certain rights related to any personal information we collect from you. The information submitted to our agency, staff and affiliates will not be used in any manner that will be deemed solicitation for other matters not regarding employment. Copyright Loughlin Personnel. All Rights Reserved.